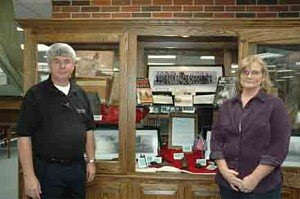 Grace College’s Morgan Library is featuring an exhibit on Camp Winona, a military camp in Winona Lake, Indiana, that trained truck drivers and mechanics in addition to basic Army training during World War I. Pictured with donated items from the camp are Bill Darr, (L), Grace College director of library sciences, and Jill Chalk, Morgan Library circulation manager. Photo by Jennifer Peryam, Times-Union. WINONA LAKE – Veterans Day is Tuesday, and the people of Winona Lake are remembering a camp where young men pursued their higher education while helping the World War I effort. Grace College’s Morgan Library is featuring an exhibit of artifacts from Camp Winona that is open to the public to view. Camp Winona was a military camp that was established and contracted by the Warsaw Chamber of Commerce and President William D. Frazer. Camp Winona’s purpose was to train truck drivers and mechanics, in addition to providing basic Army training, according to Bill Darr, Grace College director of library sciences. The camp was active from August to November 1918 as the war ended in November that year. It was located in front of what is currently the Rodeheaver Auditorium and Billy Sunday Museum in Winona Lake. The exhibit runs today through Dec. 19. Hours are Mondays through Thursdays from 8:30 a.m. to 10 p.m.; Fridays from 8:30 a.m. to 5 p.m.; and Saturdays from noon to 7 p.m. The exhibit is closed on Sundays. Men were housed in the Winona Hotel, the Westminister Hotel and the Inn at the 1000 block of Park Avenue. The Mount Memorial Building (Free Methodist Building) was used as the company headquarters. The Marshall Home (1100 block of Park Avenue) and the Otterbein (current site of the Free Methodist Church) were used as the camp’s hospitals, and Warsaw’s McDonald Hospital (Indiana Street) was used for the most seriously ill soldiers. Darr said a nice outcome from the display would be some kind of a memorial for the camp that would be in Winona Lake. Numerous community sources have helped the exhibit grow. The Hershberger family contributed an officer uniform to the display. Professor Wayne Snider, retired Grace College faculty member, donated numerous items including hand grenades. Lawrence J. McClelland, Hammond, whose father, Lawrence McClelland, was a member of the camp, donated a few photographs of the camp during the time. Lawrence recalled his father was a prize fighter and attended the mechanic school at Camp Winona. He said his father stayed at Camp Winona for six weeks and described him as patriotic. The library also purchased several photos in an eBay auction, including a photo that shows the Camp Winona men in front of what is currently Rodeheaver Auditorium and the Billy Sunday Museum in Winona Lake. The late Professor Art Davis, who was director of Grace College’s Department of Art, restored the photos. Jill Chalk, Morgan Library circulation manager, also worked on the project. “We would hope that any war would have affected how we view our life and liberties and that we would not take them for granted,” Chalk said.